Hellenistic astrology is a tradition of Greco-Roman astrology that originated in the Mediterranean region sometime around the 1st century BCE, and was practiced until approximately the 7th century. It is the source of many of the modern traditions of astrology that still flourish around the world today. This tradition originated partially out of a synthesis of the ancient Egyptian and Mesopotamian traditions of astrology, and it influenced many other subsequent traditions of astrology across Europe, Africa, the Middle East and India during the middle ages and through to modern times. 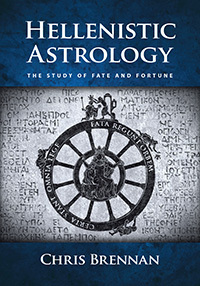 Despite its pivotal role in the history of astrology, many of the details surrounding the theory and practice of Hellenistic astrology were unknown until relatively recently. Many of the foundational texts of this tradition have only become available again over the course of the past century, and modern translations of these texts from Greek and Latin have only started to be published in the past few decades. This website represents part of a broader effort that is taking place in the academic and astrological communities today to recover and reconstruct the ancient traditions of astrology. The purpose of this website is to help facilitate the recovery of Hellenistic astrology by providing resources for researchers who would like to take part in the recovery effort, or who would simply like to learn more about this ancient tradition of astrology. Here you will find articles not only on the history and philosophy of Hellenistic astrology, but also on the astrological techniques that were used by ancient astrologers to make predictions. One of our current projects is the creation of a comprehensive catalog of biographical articles on each of the astrologers from the Hellenistic tradition, complete with bibliographies and links to translations and critical editions of the relevant texts. For more information please see our astrologers page. For those who are interested in pursuing in-depth studies of Hellenistic astrology, we offer online courses on the subject through this website. Our main online course is The Hellenistic Astrology Course, although we also offer some separate modules on individual techniques. Please see our online courses page for more information. Astrology software called Delphic Oracle is available for the practice of Hellenistic astrology. It is highly recommended for those who would like to work with the techniques that were employed by ancient astrologers during the Greco-Roman period. For recent news and updates related to the site please see our recent updates page. You can also become a fan of the Hellenistic astrology website on Facebook, follow our page on Twitter, or subscribe to our blog in order to receive an email when new articles are posted.